Environmentalists and voluntary organisations from all over the country plan to get together in the near future to protest against lacunae in the National Environment Tribunal Bill, which will be tabled in the monsoon session of Parliament. This decision was taken at the National Workshop on Human Rights, Environment and Law, held in Bangalore in May. 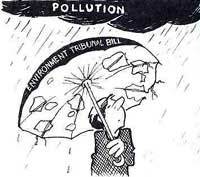 The Tribunal Bill framed by the Union ministry of environment and forests aims at developing a legal framework for establishing liability and compensation in incidents of pollution and environmental damage. It is a follow-up to the Rio summit that sought the development of national laws on the subject. However, lawyer and green activist Kerban Anklesaria points out the proposed Bill suffers from grave defects "that will defeat its very purpose." He says the proposed Bill refers only to accident claims involving hazardous chemicals. Anklesaria insists the tribunal should deal with claims resulting from all sorts of environmental damage. Environmentalists demand the tribunal should also be empowered to hear cases of damage to life and property caused by other potential sources of environmental damage, such as dams, nuclear reactors and thermal power plants. They demand the tribunal's scope be extended to cover issues of relief and rehabilitation. In addition, green groups also find illogical the exemption of government organisations from liability. But what really has got the environmentalists' proverbial goat is the proposed stipulation that the government will have the discretion to "recognise" environmental organisations that can file claims on behalf of affected people.